We had to be in Hull for 7.30pm so the guys came round to make the last pick up – me and Kate – at about 2pm. I was still tying up some loose ends so we didn’t get away until 2.25pm. My bad, but it didn’t seem too serious. 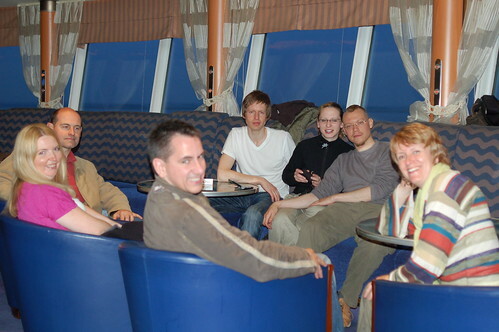 There were six of us on board (Me, Moose, Hughbert, Kate, Rosina and J-B). It wasn’t dark, we didn’t need sunglasses and we still had more than five hours to drive to Hull and more than six and a half hours before the ferry was due to leave. We were making good time, just South of Berwick, when the date caught up with us. 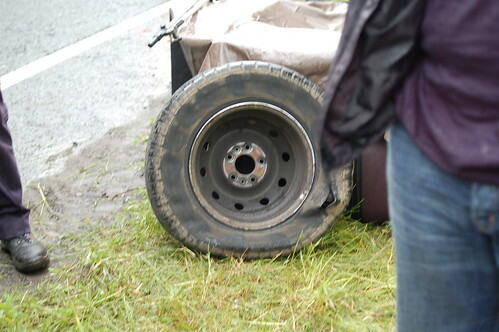 One of the rear tyres blew out (actually a good chunk of the side wall came off) and by the time Moose wrestled the van to a halt we were parked up on the grass verge with a smoking tyre so hot that we couldn’t touch it for about twenty minutes. Then the fun really started. 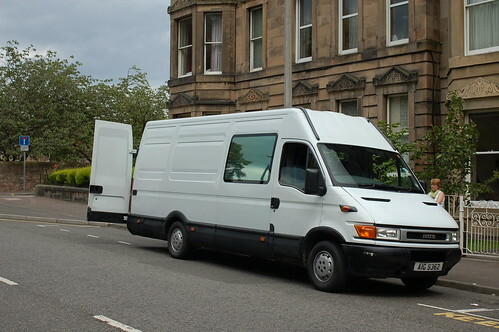 The spare was right at the back of the rear lockup box so we had to take everything out of the van: the PA, the drum kit, amps, guitars, double bass, keyboards, tens, chairs, cuddly toy, case of champagne… – all of it out on the grass, shuddering as the juggernauts hammered past. And then it began to rain. So we found a plastic sheet and covered the stuff with that, but the speed of the lorries roaring past kept pulling the sheet off so some of the stuff began to get quite wet. Meanwhile we had established that the jack we’d been provided with didn’t look up to the job (as a matter of fact it was, but more on that later) and we couldn’t figure out the jack point so we called in the professionals. 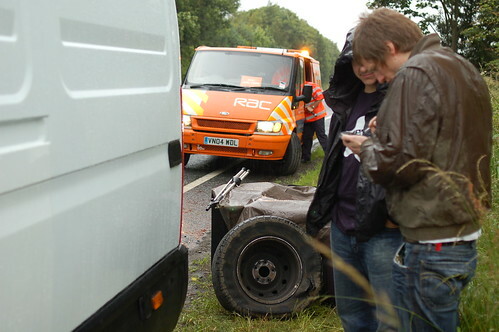 The RAC were there within about forty minutes and helped us change the tyre without making use feel too useless. One CD and many ‘thank you’s later we were loaded up and back on the road. So now the time was really tight and we were all starting to get a little nervous. We made it to Newcastle in decent enough time given the delays, but by then it was after five. Moose was back at the wheel and he’s doing his best, but of course the delay meant that we hit Newcastle in rush hour on a Friday – oh, and did I mention the roadworks? One hour later (in a stretch of road that should have taken ten minutes) we clear the Angel of the North, the traffic breaks up and we get up to speed again. Then J-B needs to stop for a piss. So we stopped and changed drivers and got going again. Course, by then it’s about 6.30 and our chance of making it to the ferry was running towards the horizon with its arse of fire. So we do the only logical thing… we ask if anyone in the van is religious. No one is. Damn. No divine intercession. No sudden but very temporary engine faults in the boat. No sudden but brief storm forecast to affect the harbourmouth at Hull. There’s just the eight of us, equipment for a European tour, half a spare tyre, a full set of very expensive tickets, a faint hope that they might let us on if we got there before they sailed, a two hour drive and a van with the cornering capacity of a blancmange. Miracle of miracles, we got on the final stretch of motorway by about 7.30. It seemed like we might make it by 8.30pm. The checkout colsed at 7.30pm, but like I said, we decided to hit and hope. Fortunately, despite the van handling, we didn’t hit anything and we still had our hope, but then I looked down at the fuel guage and it appeared to be going into freefall. (By that stage I was driving. I can’t remember why or if we stopped again but I suppose we must have. I suspect French bladder control.) What had appeared to be a light that said ‘just to let you know Marty, we’ll need more fuel in 60 miles or so’ became, within the space of ten minutes, ‘Hah! Screw you!’ and indeed dangerously close to ‘Urgh, I die…’ We had a quick confab up front and decide to push on. By then we were in the outskirts of Hull and it was well after 8pm. We didn’t see much traffic on the way through town (it may have been there, but, well…) and we made it to the ferry port at 8.20pm, and pulled into a deserted bay. Just then, a guy comes running across to us to tell us we were in the wrong place so I engaged reverse, nearly blinded by the fuel warning light, and attempted to get out of there and keep alive flame of hope that was now sputtering asthmatically. And then he shouted after us: ‘It’s alright mate, there’s no rush.’ I nearly got out and kissed him. So we found the traffic queue for the check in desk and there was one car and a motorhome in front of us. And they had just closed the gates behind us. I switched off the engine because by now I was having to apply factor 15 to my face due to the glare from the light. I waited until the car had gone through. The motorhome rolled forward and still I didn’t move. They messed about for a bit with him and then waved me up. I clenched my bowels and turned the starter and… we were off! Rumbling casually up to the desk. I switched off the engine again. It pays to be green. Five minutes later – there was some issue with cancelled cabins due to us being so late – we were handed the boarding passes and I turned the key, waited for the little orange coil to go out and… the engine kicked into life again. So I drove up and round the corner and there was all sorts of whooping in the back and being the eternal optimist I was saying to myself, ‘There’s no point celebrating yet, we still have twenty yards to go…’ But the euphoria was infectious and even when I was asked to reverse onto the boat (which meant a three point turn on the dock and the further possibility of stalling/conking out) I had only a flicker of insane and bowel rendering fear. But we made it. I pulled on the handbrake as they turned the motors on to raise the back door. That’s how close we were to not getting on the ferry. Cor, a cliffhanger in Hull… Whoodofunkit. Thanks for a fun read (but I’m sure not a fun experience)!